Phil Grenadier’s “Shimmer”(Fresh Sound/New Talent). 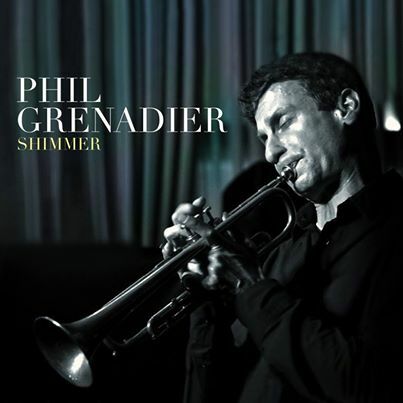 THE TRUMPETER PHIL GRENADIER RELEASES NEW RECORDING ‘SHIMMER’ ON FRESH SOUND/NEW TALENT IN FEBRUARY, 2014. A concert at the Jazz Gallery in New York City is scheduled for Thursday, February 6th featuring Grenadier, Larry Grenadier (Bass) and Bill Stewart (Drums). His latest recording “Shimmer” (Fresh Sound/New Talent) showcases his collaboration with Boston colleagues Will Slater (bass) and Karen Kocharyan (drums) and is set to be released in February of 2014. To celebrate, Grenadier will perform at The Jazz Gallery located at 1160 Broadway in New York City on Thursday, February 6th 2014 that features Phil, Larry Grenadier (Bass) and Bill Stewart (Drums). Growing up in a musical family in San Francisco, he and his brothers Larry and Steve were all introduced to trumpet in childhood by their father Albert, who handed his lifelong love of music down to his sons. Although Larry and Steve eventually gravitated towards bass and guitar, respectively, Phil wholeheartedly embraced the possibilities of trumpet and made the instrument the focus of his musical life. The three brothers played together in their high-school band and various other combos, performing together at such renowned festivals as the Monterey Jazz Festival, the Russian River Jazz Festival and the San Francisco Jazz Festival. Meanwhile, Phil’s rapidly-developing trumpet skills won him considerable attention around his hometown. By the time he was 16, he was working regularly as a sideman, performing alongside such legends as Ella Fitzgerald, Mel Torme, George Shearing, Tony Bennett, Carlos Santana, James Brown, Sammy Davis Jr., Dionne Warwick and Steve Smith’s Vital Information. He was just 17 when he was voted Best Jazz Soloist by both Down Beat magazine and the California Music Educators Association. A move to New York in 1988 helped to further broaden Grenadier’s musical horizons. There, he taught jazz trumpet at the Mannes College of Music, and worked extensively with noted saxophonist/composer Bob Belden, playing on two of Belden’s Blue Note albums and numerous live gigs. During his time in New York, Grenadier also performed and recorded with such notable musicians as Owen Howard, Chris Potter and Seamus Blake. In 1995, Grenadier relocated to Boston, where he’s continued to embrace new musical challenges while recording and performing around the world. 2000 saw the release of his first album as a leader, Sweet Transients, which also featured Ethan Iverson and Bill Stewart. It was followed in 2003 by Playful Intentions, whose cast also included the likes of Kurt Rosenwinkel and Jeff Ballard. While continuing to develop his own music, Grenadier has remained in demand as a sideman and collaborator. One particularly fulfilling project has been his work with seminal guitarist John Scofield. In 2007, Grenadier toured across Europe, South America and the United States with Scofield’s group, which also included bassist Steve Swallow and drummer Bill Stewart, with the tour culminating in a sold-out performance at NYC’s Carnegie Hall. In addition to leading his own acclaimed Boston-based trio (with whom he recently completed a soon-to-be-released new album), Grenadier continues to maintain productive working relationships with saxophonist Jerry Bergonzi, with whom he’s recorded two albums and toured Europe; and Portuguese drummer Joao Lencastre, with whom he’s made four albums. In addition to the aforementioned musicians, Grenadier has played on more than 50 albums while working with a varied assortment of artists, including Kenny Barron, Larry Goldings, Kevin Hays, Marc Copland, Bill Carrothers, Chris Potter, Anthony Braxton, George Garzone, Mick Goodrick, Brad Shepik, Billy Kilson, John Hollenbeck, Gerald Cleaver, Bob Moses, Drew Gress, Ira Coleman, Bob Nieske, Harvey Wainapel and brother Larry Grenadier. Welcome to the Website of Jazz Trumpeter Phil Grenadier.